"A church is more than the bricks and boards used in the structure." Dempsey Essick said. "A church is both a sanctuary and a beacon. 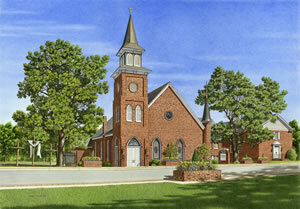 The First United Methodist Church stands as the most prominent beacon on North Main Street in Mocksville. It is a beautiful building which reflects years of devotion and commitment on the part of a congregation with roots back to the very beginnings of this country." Commissioned by the church to create an original painting to hang in its narthex, Dempsey set his sites on the long admired historic building. The painting title, "Blessings of Grace," was chosen by the FUMC congregation as an acknowledgment of God's promise of new life because of Easter morning. "The two things that caught my eye about the church were the unusual double steeples and the stained glass windows." Essick said. "Now that I have completed the painting I have come to appreciate the many beautiful bricks and I feel as if I mortared and stacked every one of them." For many years Dempsey Essick has said that ifhe didn't live in Davidson County he'd like to live in Davie. "My wife, Shelley, began her postal career in Mocksville," he said, "and I've been involved in the Davie Crafts Fair for many years. I've come to love the people and the town. I've even begun a 'Down Home in Davie' series which thus far has included the Davie County Courthouse as well as October's Treat which was a tribute to Granny Naylor and the 1. P. Green Milling Company." "I am honored to have my work hanging in this historic church for members and visitors' alike to enjoy as they come to worship." Onlookers will enjoy searching for the rebus type image of a hummingbird hidden in the painting. The First United Methodist Church grew out of the Bethel Methodist Church located one mile east of Mocksville. In 1833 Jesse Clement of Mocksville went to Bethel to hear a sermon by CP. Moorman. Both Clement and his wife were converted to Methodism. Soon regular services were held at their plantation home on West Maple Avenue and other places in mocksville. On a lot given by Mrs. Lucretia Carter (where theMocksville Police Station presently stands) a white frame church was built with a balcony (for slave members) and steps leading up to two front doors. In 1836 the church listed sixty-six members of which forty-one were slaves. In 1836 the Mocksville Circuit was formed by Davie County Methodist Churches. Formerly churches in Davie County were in the Salisbury Circuit. The new circuit was formed when Davie County was formed from Rowan County in 1836. In 1872 the Mocksville Circuit was divided into the Davie and the Mocksville Circuit. First Methodist continued as a part of a circuit until 1896 when the present sanctuary was built and the Mocksville church became a "station church." Two times in the 1800's the North Carolina Annual Conference met in Mocksville, first in 1840 and again in 1864. At both of these annual conferences town and county residents of all denominations helped to provide accommodations for ministers and horses. Also, Davie Country court was held in the first sanctuary after Davie County was formed in 1836. Davie County's first courthouse was not completed until 1839. In 1891 plans were made for a new church building, and a lot was bought across Main Street from the original church. In 1894 the church sold forty feet of the new lot for a road, now Church Street. In 1895 the old church building was sold except for the foundation stones. By that year $1,481 had been raised for the new church. The present sanctuary was built and was dedicated in 1896 by Bishop Wallace Duncan. In 1917 the first separate facility for Sunday School rooms was built. The "North Annex," as it was called, is currently used as youth Sunday School classrooms, the had bell choir room, and parlor. In 1918 a Delco plant was installed to produce lighting. In 1933 the South annex was completed to provide a small fellowship hall, indoor restrooms, and adult Sunday School rooms. The South annex currently houses the choir room, the church library, and a storage room. In 1955 a larger Fellowship Hall was added to church facilities. Today the old Fellowship Hall is divided into a Sunday School classroom and small fellowship hall. In 1948-49 the sanctuary was remodeled. In 1957 the Education Building was constructed to house classrooms for children. Today the building houses the preschool programs and Sunday School classrooms. In 1973-74 the sanctuary was again remodeled, as were the North and South Annexes. The refurbished sanctuary and addition were dedicated by Bishop Earl G. Hunt, Jr. on February 22, 1976. The Education Building was redecorated in 1986-87. Property was purchased from the C.B. James estate in 1988 to allow for expansion possibilities for the future, and a parking lot was purchased in the 1990's. The Heffner (later Food Lion) grocery store building was purchased by two church families in 2001 and presented to the church with the intention of converting the building into a Family Life Center. More than $1,200,000 was spent on this building which today houses a large fellowship hall with commercial kitchen, offices for church staff, large meeting rooms for Middle School and Senior High UMY groups, and facilities for scouting programs. The new Family Life Center was opened in 2002.